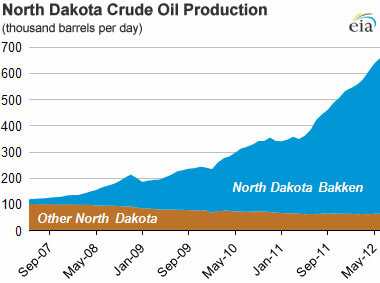 Bakken Formation oil production graph: Oil production from the Bakken Formation in North Dakota has been rising rapidly, making the state the #2 oil producer in the United States. Data from the North Dakota Geological Survey. Throughout history, most great oil and gas fields were "discovered." The Bakken was "unlocked" through innovation. 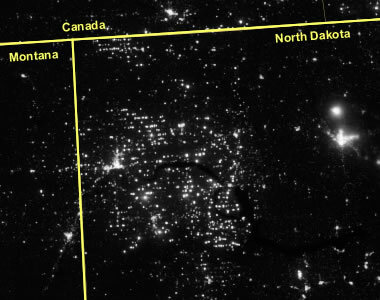 Bakken Natural Gas Flaring: Northwestern North Dakota has one of the lowest population densities in the United States; however, this night lights image from NASA shows the area has hundreds of points of illumination. 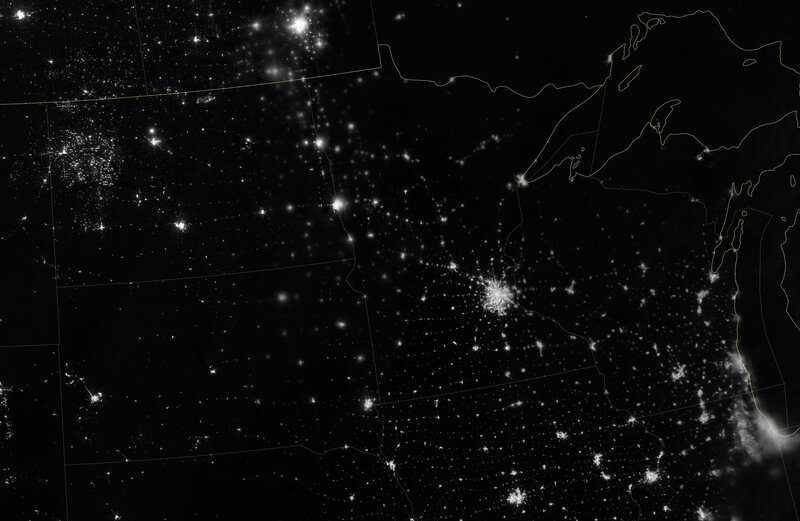 Many of these lights are Bakken Formation oil wells where natural gas that does not have a pipeline to market is being flared. Flaring is common practice in the oil and gas industry. Many object to this practice because it wastes natural gas and contributes greenhouse gases to the atmosphere. Enlarge image. Source image by NASA. The Bakken Formation is one of the largest contiguous deposits of oil and natural gas in the United States. It is an interbedded sequence of black shale, siltstone, and sandstone that underlies large areas of northwestern North Dakota, northeastern Montana, southern Saskatchewan, and southwestern Manitoba. Bakken Formation Map: The Bakken Formation underlies large areas of northwestern North Dakota, northeastern Montana, southern Saskatchewan, and southwestern Manitoba. The green area on this map shows the approximate extent of the Bakken oil play. 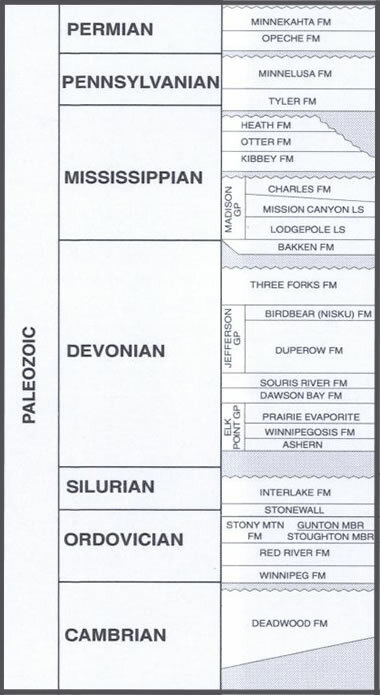 The Bakken was deposited within the Williston Basin and is Late Devonian to Early Mississippian in age. The Bakken Formation consists of a lower shale member, a middle sandstone member, and an upper shale member. The shales are organic-rich and of marine origin. They are rich source rocks for oil and natural gas. All three members of the Bakken Formation have been known to yield oil and natural gas. Bakken Formation Oil: The Bakken is one of the largest oil finds that the US Geological Survey has ever assessed. Although this video was produced in 2008, the information contained within it was a great prediction of Bakken Formation assessment and development. Just a few years ago in 2007, the Bakken was considered a marginal to submarginal resource because the oil and natural gas are locked in a rock formation with a low permeability. However, advances in drilling and recovery technology such as horizontal drilling and hydrofracturing have transformed the Bakken into a prolific oil and natural gas producer. Since then the Bakken has propelled North Dakota oil production to record levels, moving the state to the position of #2 oil producer in the United States. The only state that produces more crude oil is Texas. The Bakken Formation has also given a major boost to the North Dakota economy and reduced unemployment in the state to very low levels. The Bakken resources are expected to be productive for decades and make a major contribution to the energy independence of the United States. Bakken Oil Boom: This video explains the impact of the Bakken Oil boom on the real estate industry. AP Video. Bakken Stratigraphy: Generalized stratigraphy of Paleozoic rocks in the Williston Basin of Montana. From Montana Board of Oil and Gas (source). Horizontal drilling and hydraulic fracturing: Advances in drilling and well stimulation made the Bakken Formation a viable oil and gas resource. Horizontal drilling enables wells to have a much longer "pay zone" than a traditional vertical well. 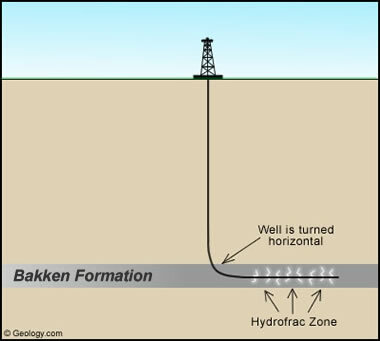 Hydraulic fracturing produces porosity in the rock unit that facilitates movement of oil or gas to the well. Together, these methods allow a single well to drain a much larger volume of rock and more efficiently recover the oil and gas resource. The USGS Assessment for the Bakken Formation estimated mean undiscovered volumes of 3.65 billion barrels of oil, 1.85 trillion cubic feet of associated / dissolved natural gas, and 148 million barrels of natural gas liquids in the United States portion of the Bakken Formation. These resources are contained within both conventional and unconventional reservoirs. The Bakken Formation in Canada contains additional resources and has been called one of the largest oil fields in Canada. In early 2008 only a few wells had been drilled into the Bakken, and its viability as a resource was uncertain. However, by the end of 2012, thousands of successful wells made it one of the most important crude oil sources in the history of North America. Throughout history, most great oil and gas fields have been discovered. The Bakken Formation was unlocked through innovation.